Last year we vacationed to my favorite place on the planet! As a former Disney College Program alumni, I absolutely adore Walt Disney World Resort! We visit Disney World quite a bit because of my Parent’s DVC membership. I’d recommend the DVC program to all... Seriously, it's worth more than the value, and the resorts and amenities are amazing!! This was our first adventure to Fort Wilderness and it didn’t disappoint. It's a campers dream if you're as obsessed with Disney, like myself! 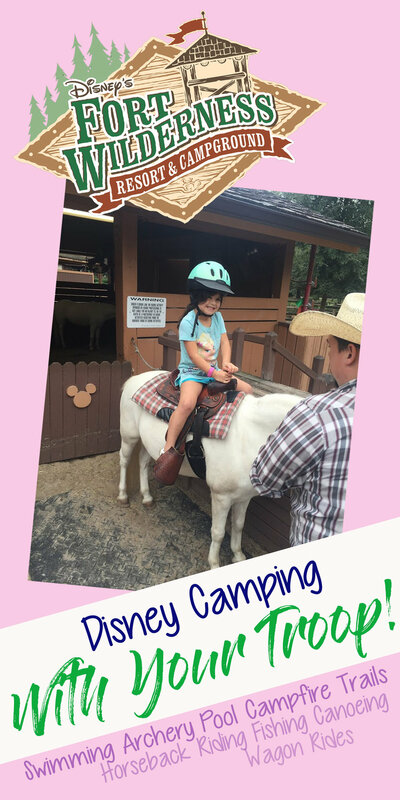 Ryleigh was super excited for the Fort Wilderness campgrounds due to her love of horses and she‘d specifically requested THIS resort. We stayed in one of the cabins. I'm anticipating our next trip and staying in the campgrounds with our RV! They also offer affordable group camping sites if you’re looking for something more primitive with your troop. This is probably the most affordable way to travel to Disney World with your troop. Check out the Creekside Meadow camping for scout and youth groups. You might have to specifically inquire with one of the Disney customer service reps as it’s hard to find details and prices on their website. If you’re looking for something a little less primitive, you can choose one of their sites that offers electric and water. Disney has tent and equipment rentals too in case you don’t want to haul all your gear! There’s sooo many amenities here! You wouldn’t need to leave the campgrounds with all the things to keep you entertained! Here are a few to get you started…. Chip n Dale's Campfire Sing Along - who doesn’t love a Disney campfire? Have you been to Disney’s Fort Wilderness Campgrounds before? Let us know what you thought in the comments! !